Dear Quilters. As promised, a tutorial on how to create these diamond string blocks. Don’t throw out your strings. Have you got a bag or two of strings of fabric lying around. If you don’t and you threw them out maybe you will reconsider keeping them. 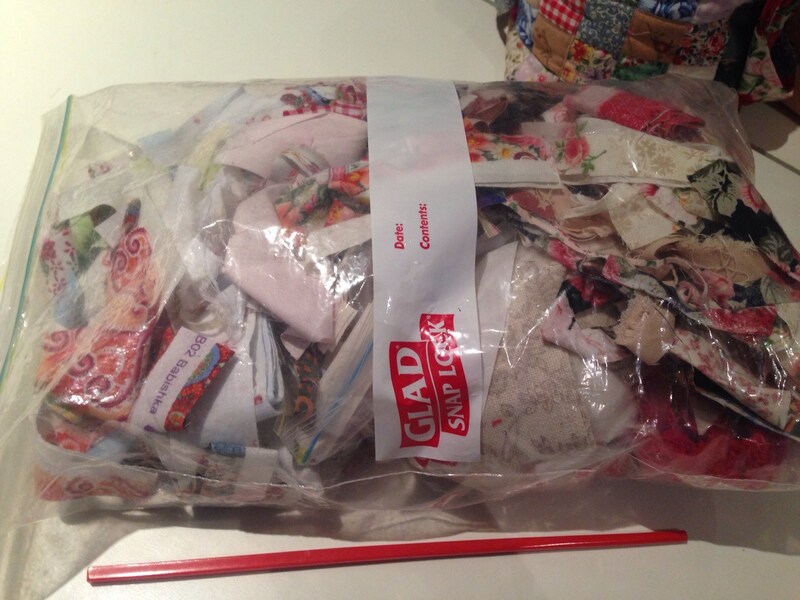 Would you be surprised to learn that a bag of strings like this one, by weight, is equal to about 3 metres of fabric. If you are paying $22- a metre for fabric, that bag could have $60- worth of fabric. For me I love them because they are already cut. They are ready to put into a project, whatever that my be. In fact when I am cutting my fabric I have a bag on my cutting table just for the fabric strings. I put them directly into that bag. No need to sort again. My inspiration for this block. From the first time I saw quilts with this type of pattern, I really liked them. Sometimes, certain patterns just strike a chord and this is one of them. I’ve never tired of it. I’m happy to be corrected but I think the closest block description is Endless Chain. This is my adaptation of it. It is certainly not the original, which I believe may have been paper pieced. Mine is a string block. It works very well as a string block. A lot of dimension is created. I decided to use a bag of strings to make these blocks. It’s good to remember that the fabrics you are using, are your fabrics. You already know that you like them. They may be all mixed up, but it doesn’t matter. Don’t worry about mixing styles of fabric either. It will add to the project and it also becomes a memento of fabrics you have used in other projects. It’s good to have some solids too. Mix up solids and prints. It will make the diamonds more lively and dimensional. You can use very thin strips of fabric, this will also improve the look of the blocks. 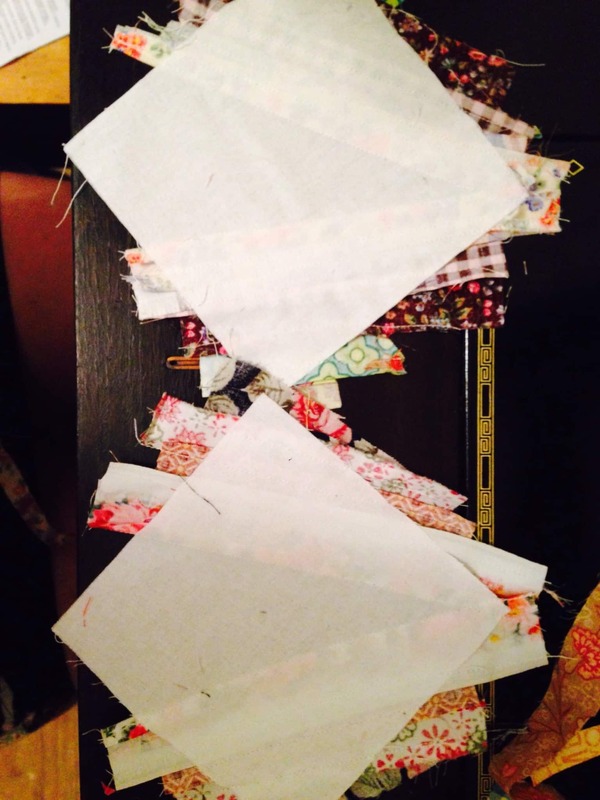 These quilt blocks are made by foundation piecing strings of scrap fabric onto 5″ foundation blocks. This keeps the block very stable and square, without distortion. Choose your background fabric. Mine was just white homespun squares, cut int o 5″ Charm Squares. 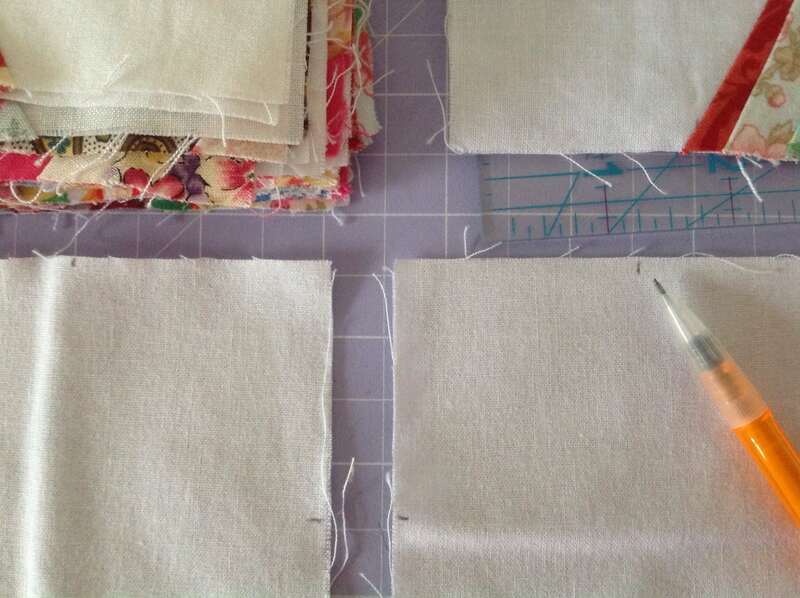 Depending on the size of the quilt you want to make, will dictate how many 5″ squares to cut. 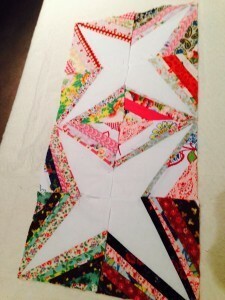 Four squares sewn together create the block. On one side of the square, measure 2″ exactly from the corner. Using a pencil, mark that point, then make another 2″ mark on the other side of the same corner. The area in between will stay blank down to the opposite corner point. The outside areas will be filled with strings. Begin by placing a string right side down on the right side of the 5″ square and overlapping the pencil mark by 1/4 inch. Line the same edge of the strip with the centre of the bottom corner of the block. 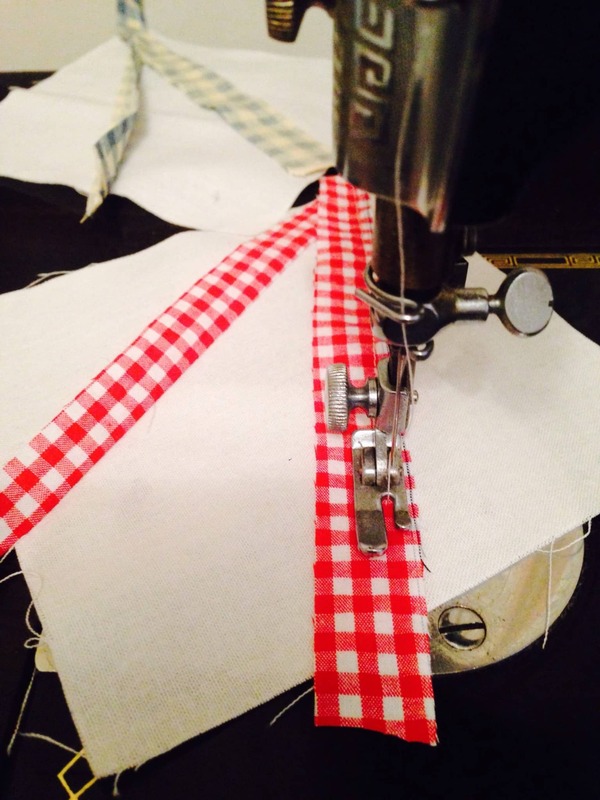 Sew down the strip using a 1/4 inch seam. Lining up the outside edge of the string with the corner will ensure that there is at least a 1/4 inch overlap at the bottom corner. This will ensure the points are not lost when the blocks are sewn together. Turn the string back. Finger press the string nice and flat. Choose your next string. Put the string right side down from the bottom corner of the block overlapping the 1st string and line it up to the opposite corner 2″ pencil mark overlaying it by 1/4 inch. Sew down the strip using a 1/4 inch seam. Turn the strip back towards the outside and finger press flat. Now you have the outline of the string block. Always make sure that each string is longer than the distance to be spanned, as when it is turned back it needs to reach beyond the edge of the 5″ block. Choose the next string and place it right side down on the previous string, lining up the edges and sew down as before. Turn the string back. Finger press flat. Keep repeating until the side is full. Usually between 4-7 strings on each side. Then repeat on the other side. NB If you are using very wide strings it may pay to press them with an iron to make sure they sit nice and flat before adding the next string. Of course you can have a few units going at once. Once the unit is complete, press and trim to match the foundation fabric block underneath. Using a fabric foundation keeps the block very stable and square. Once each side of the block is filled with strings, the units will end up looking like this. This is how the units look from the reverse side before they are trimmed. 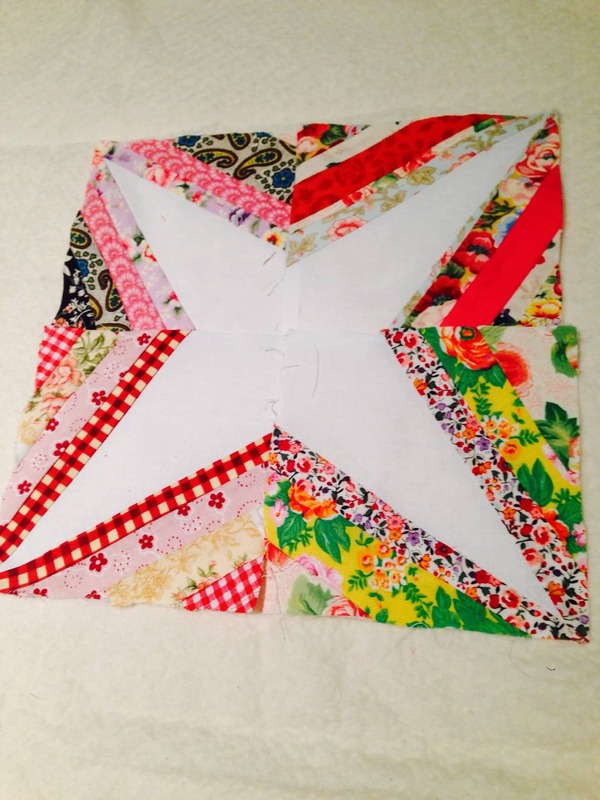 Sewing four units with the white star in the centre creates the block. Keep making units until you have enough to make the size of project you desire. Have fun using up all your strings. Please leave a question or comment about this tutorial if you require any further information. 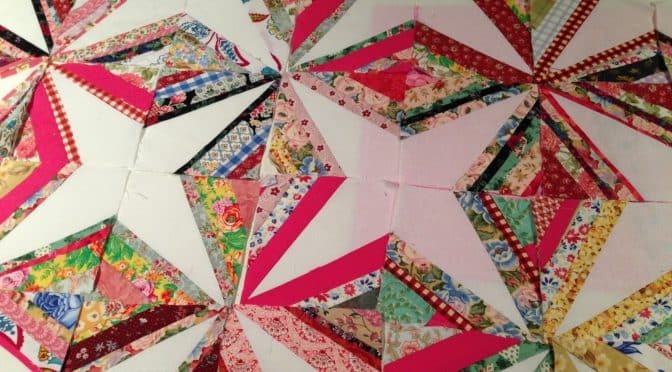 I do not plan to quilt over the top of the strings but rather in the remaining foundation, because the string areas will be quite dense with fabric. I have never saved strings. What size should I cut some? Hi Cathy, 3/4” to 1 1/2” strings should work well. 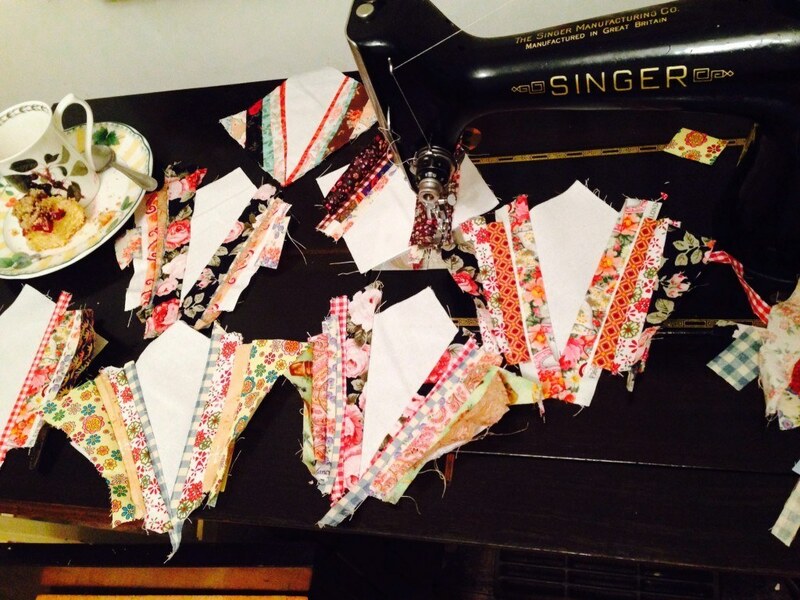 Just save your off cuts when you are cutting fabric or straightening edges. Just wondering how the block/quilt sits with the two different thickness…….i.e. ….. the base and the strings ? I made this with red background fabric and I absolutely love it! I also made a scrappy inner border. Thanks for the pattern. 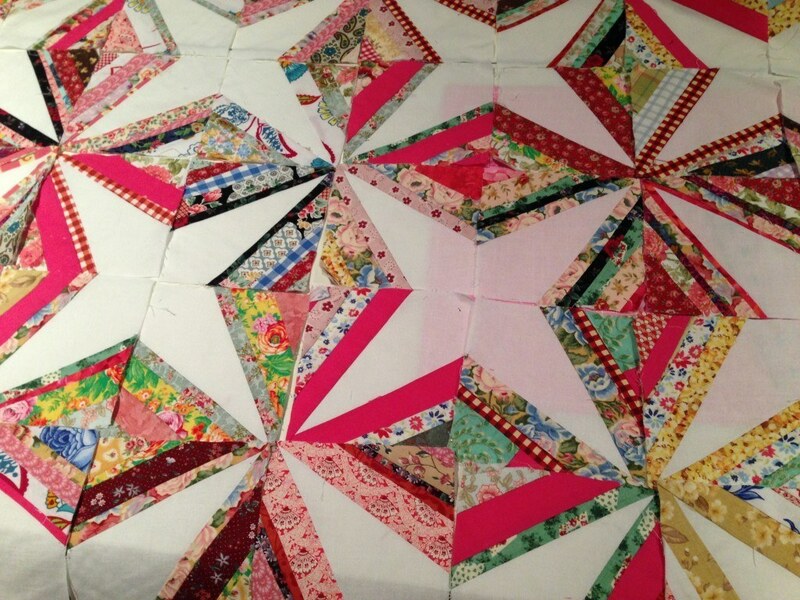 Thank you so much for sharing the beauty and joy of how to make this magnificent quilt. I have 2 great nieces who want to learn to quilt, and this will be a fantastic start! Just can’t get this one out of my mind! Susie, I was soooo happy to find this pattern. I am 70, my husband 76…His grandmother made him this quilt and now I have it. It is hand stitched. My friend and I have been trying to figure out where and how to start…now we know!!! Thanks again!!! Great info for using scrap stash. You explained technique so anyone can follow. Thanks for sharing this pattern. I definitely will try it soon. Does the 2” measure change if you want to start with an 8 or 10” foundation? I read your post in pintress this morning, all I could think of all day was getting home to try this. What a great idea I hate throwing away my strings, but could never think of anything to do with them. Thanks for sharing. Lovely! I can’t wait to use up my strings. Is there some reason why I shouldn’t just measure 1 3/4″ and put my fabric on the mark lines instead of trying to overlap the marks 1/4″? Saw your string baskets and wondered if you also made string blocks. 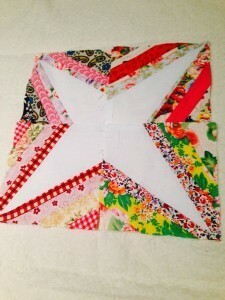 Love these pretty stars, I have a string star top that needs quilting. Did not have string scraps so cut from yardage in my stash. BTW- found you via FB link you shared on Treadlers. That’s great. Love to see your finised product too! Thank you. 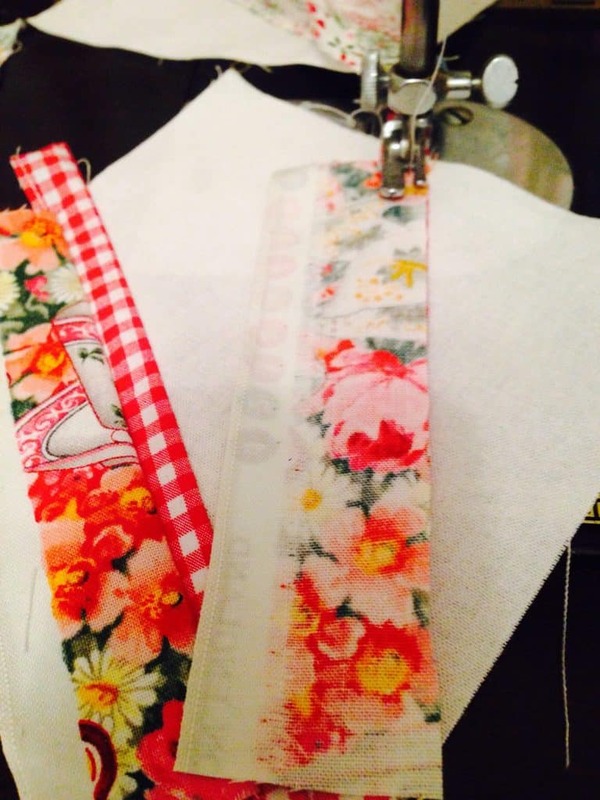 Your tutorial is so easy to understand.I look forward to having more scraps that I can use. I’v just started quilting. Thank you Brenda. I’m glad you like it. Hope your projects go well!